It is necessary to reconfigure the bus station so that its works with a two-way road layout. 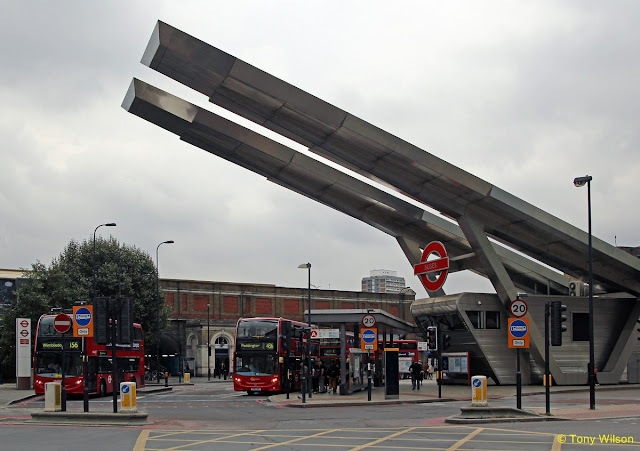 The existing bus station was designed as part of the current one-way road system in Vauxhall – buses circulate around an island and exit in different directions as required. The existing bus station entrance/exit is within the Kennington Lane/Albert Embankment junction. Under a revised two-way layout this existing access would not be viable and would need to be altered to safely accommodate improvements to cycle and pedestrian provision. Removing the section of road used by buses would allow us to create a new pedestrianised square outside the Network Rail and Tube station. A more welcoming and pleasant public space would also mean a safer and easier interchange at the centre of Vauxhall. The proposals provide a new canopy and bus station buildings that would be fully integrated with the new pedestrianised square and two-way working arrangement. The proposals for the new bus station would ensure that facilities such as weather cover, public toilets, seating, information displays and maps, and an information kiosk are provided. Shelter from the weather would be provided in the main bus station area by a new canopy. The stops at the Parry Street end of Bondway, on the western end of Wandsworth Road, and on Kennington Lane would also have weather protection, with a complementary look and feel to the bus station canopy. There are also options for weather cover between the Network Rail and London Underground stations. It appears that these proposals would see the removal of the distinctive 'ski slope' canopy, which has been a prominent feature in the area. The very busy Vauxhall Station can be seen close by in the background, which serves both London Underground's Victoria Line between Brixton & Walthamstow and Network Rail lines out to the south and south west London suburbs and beyond.